Teaching others all about how to trade options is our business and we are good at it! We take pride in turning beginners – or any level traders for that matter – into better traders with our options trading courses. You may not be ready to invest in major education just yet, but here we are offering you a starting point: our Free Options Trading eBook. We have compiled this eBook with a wealth of information, not just for the beginner but also for intermediate and advanced traders. 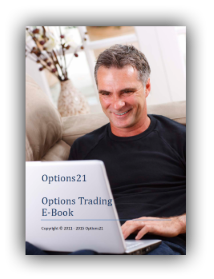 It contains 68 pages of information, including charts, recordings and trade examples!